Are You Going For A Veggie Diet? Did you know that a well-rounded vegetarian diet would keep you healthy and fit all day long, and promote strong bones and teeth? Incorporate a lot of healthy vegetarian recipes in your daily diet and observe the difference. The American Dietetic Association emphasizes on the health benefits of a vegetarian diet and underlines the fact that eating vegetarian foods is mandatory at all stages in a person’s life- right from childhood to old age. What do vegan foods contain? There is a general myth that says switching to vegetarian diet will put a limit to your experimenting food habits. That is wrong, because you can prepare hundreds of interesting and mouth-watering meals and delicacies with veggies. If you eat the right amount of mixed vegetables every day, you don’t have to eat vitamin and mineral supplements. You can consult a dietician to know what kind of diet pattern will suit your lifestyle. If you are worried about calcium content, then don’t worry because foods like collard greens, almonds, soybeans, broccoli, oranges, Brazil nuts, sesame seeds and spinach can provide you with enough calcium. And of course, you can consume milk, cheese and yogurt if you are lactose tolerant. Vegetarian diet is rich in protein content too and eating nuts, bread, pasta, rice and cereal would give you sufficient amount. If you switch to a vegetarian diet to lose weight, then you have to be very careful with what you eat. Some vegetarian recipes like tofu, soy hot dogs, soy patties and refried beans are high in fat content. To get the real health benefits of a vegetarian diet, you can start by eating whole grains. They contain the right amount of fiber, vitamins, minerals and antioxidants. Go for refined grains only if you have no other choice. Fiber foods are good for the heart as you can lower cholesterol levels. Eating the right amount of fiber at regular meal hours will sustain you till the next meal time. You don’t have to spend hours whipping up tasty dishes with vegetables. In fact, vegetables will lose their nutritional value if you cook them for a longer time. Scientists have proved that plant-based foods can actually block cancer progress. If the disease runs in the family, then eating vegetarian food on a regular basis can protect the cells to a certain extent. About 30-35% of cancers are related to diet. You can ward off colon cancer and diabetes too by eating a vegan diet. Proponents of raw food believe that cooking foods above 116 degree Fahrenheit will destroy the enzymes that aid in digestion and absorption. When you eat healthy foods, you will feel good emotionally and physically. You have thick and shiny hair, healthy skin and better menstruation cycles. You have tasty and nutritious alternatives to meat, poultry and fish, so enjoy those vegetarian dishes by having them fresh each day. There is nothing like freshly cooked vegetarian food to satiate your taste buds. Vegan foods are nutritionally adequate, and you can try a variety of innovative dishes that everyone in your house will love. To get the true health benefits of a vegetarian diet, you can supplement your daily vegan diet with just the right amount of fruits and boost immunity. 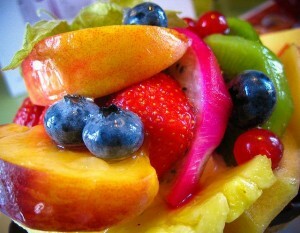 Go for seasonal fruits because then you can have them fresher and tastier. Next story Peace Of Mind Is Nothing But A… Myth, Do You Think So?